Speak // Hardcover // 400 pages. Everyone thinks Annabel’s life is perfect. That is, except for Annabel. After a really awful summer, Annabel goes back to school and does her best to get through the school year despite the fact that both her best friends have dumped her. And then Annabel meets Owen and her life changes drastically once again. Nearly two years later, I still find myself recommending this book to my tenth grade girls like it’s water. Nearly every one of them has read it, and they begged me to include it on our Teen Book Club vote (and I did) so that they could vote for it (which they did), and get their own copies (which the library bought them). 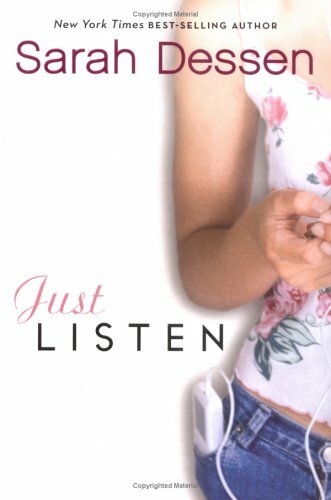 Even though I would argue that Dessen has a pattern with her novels (girl has problems in life, girl meets boy, girl changes her life — sometimes because of boy, not all the time, girl and boy get together, yay), I’m not bored by it and find myself instead wow-ed by her characterization and language. Every time I close a Sarah Dessen novel, I smile and want to start reading it again from the beginning. Pick one up if you haven’t! You won’t regret it. The Disreputable History of Frankie Landau-Banks by E. Lockhart. Hyperion // Hardcover // 352 pages. Frankie Landau-Banks is getting ready for another year at boarding school. Last year she coasted by without doing anything. This year will be different. After discovering that her new boyfriend Matthew is in charge of a boys-only secret society, Frankie vows to secretly infiltrate it at any and all costs. I was so pleased when I found out this book was one of the Printz Honor Books for 2009. I was even more pleased when I had the pleasure of attending E. Lockhart’s acceptance speech (and, of course, all the other winners). This book is a challenging read, and I know that teenagers welcome it. They can’t stand to be talked down to. And I am so pleased that YA authors realize this and write books like this one. A great narrator tells a great story. What more could you ask for? Harcourt // ARC // 480 pages. Reviewed from an ARC copy, received at ALA’s Annual Convention, 2008. Katsa is Graced with the ability to kill, and everyone around her uses her ability to their advantage. When Katsa meets another Graced fighter, she finds herself questioning her life in her Uncle’s palace. With Po’s help, Katsa begins a journey to another kingdom and perhaps to another destiny. I originally read “Graceling” as an ARC and immediately ordered it for my library and teens. I really believed in this book, book-talked at Teen Book Club, and I’ve been pleased with the circulation rate (five times in seven months…that is a lot for my crew of reluctant readers). A couple of my girls bug me at least once a week about “Fire” since they caught me reading the ARC. I’m still enamored with this book and I love Katsa. I think she is a great character, strong but with her own flaws. To me, that’s what makes a book memorable — human characters, characters that I know I could meet regardless of the world they live in. And that’s another story entirely — the world that Cashore has created is strong, vibrant, and has held up through the prequel/continuation/sequel (which I promise I will review shortly!). Still a safe bet for high fantasy fans, and a great way to introduce new teens to the genre.